The Col de Jaman is just to the left of the obvious pyramid (the Dent de Jaman) in the left centre of this shot. Its about 4000ft feet up to the col. If you are not a cycling geek, feel free to stop reading now, as this post may not interest you much. 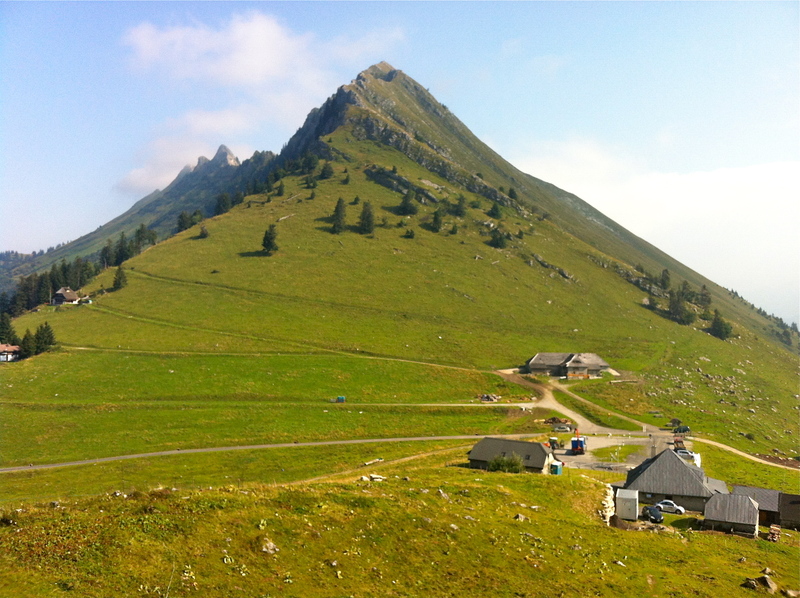 I am just going to describe my first experience with tackling a bona fide mountain ascent in the Alps on my road bike. One of my goals while living here is to ride as many of the classic mountain ascents from the Tour de France and the Giro D’Italia as possible, such as the Alpe d’Huez, the Col de Tourmalet, and the Passo Stelvio. While I may not get a crack at any of the classics until the summer of 2013, I am wasting no time in trying to get up some big climbs this fall as training for the bigger routes. 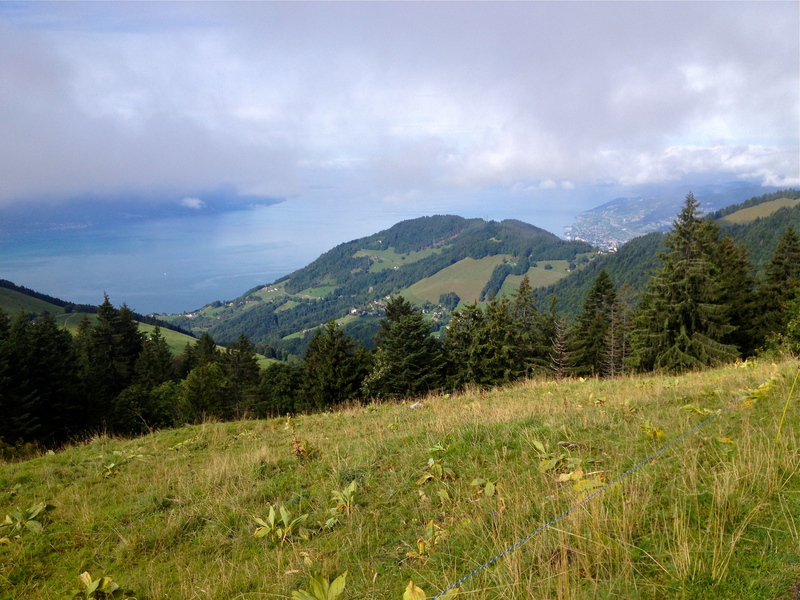 Last week I made a first tentative foray into the hills of the nearby Lavaux region and found a few easy climbs of less than a thousand feet to test my legs on (see previous post). Since one is hard-pressed to find a hill in southern Ontario that takes more than a few minutes to climb, I was a little uncertain about how I would fare in the hills and mountains of Switzerland, some of which can take over an hour to ascend! As it turns out, despite the lack of big climbs, the rolling countryside of Oro-Medonte township, where I have done a lot of my cycling the last few years, seems to have served me fairly well. Once I began to feel a little more confident about my fitness and climbing ability, I began to scope out some more ambitious climbs nearby. One potential destination that peaked my interest was the Col de Jaman, a small col beside the prominent “Dent de Jaman”, a dagger of rock that thrusts out of a ridge high above the town of Montreux and that is visible for miles around. While researching hiking and climbing routes on the “Dent” I learned that there is a restaurant at the top of the col and so I immediately began looking for a good road to access the col by bicycle. After poking around on Google Maps I identified a plausible looking route which started in the town of Montreux on the shores of Lake Geneva (approx 450m) and climbed up a series of steep switchbacks through the villages of Glion and Caux, before easing off and contouring up to the col at 1550m. That’s a total of almost 4000ft of climbing! According to a variety of sources, the average gradient of the climb is 7.6% over 14.4km, with some steeper pitches kicking up to as high as 21%. While I wasn’t sure I was ready for something this ambitious, I woke up last Sunday morning with the urge to explore, so I decided to just go for it and see what happened. 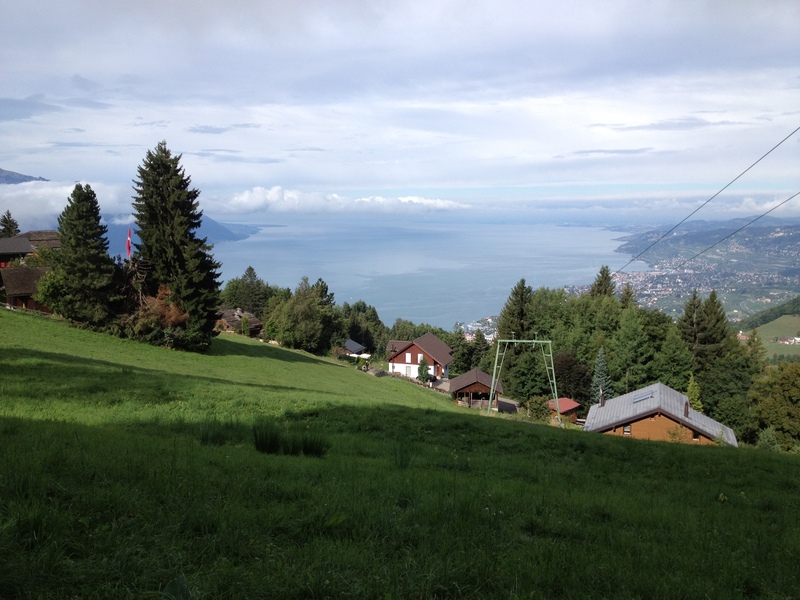 The climbing begins as soon as one turns inland from the main drag along the lake in Montreux, following the signs for Glion and Caux. The gradient was pretty reasonable up and through to the top of Montreux, and I was able to pedal at a reasonable pace without allowing my heartrate to get too high (steady Zone 3, sustainable for an hour or more). One of the equipment modifications I made to my Colnago CLX just prior to departing Canada was to exchange my standard 52-39 front rings for a “compact” 50-34, to give me a few more granny gears for the big mountains. I had already put a 28-11 cassette on the back for this purpose when I rode the Blue Mountain Centurion race last year, which featured 7000ft of climbing over 171km. I was very thankful for this compact set-up on this first outing in the mountains. 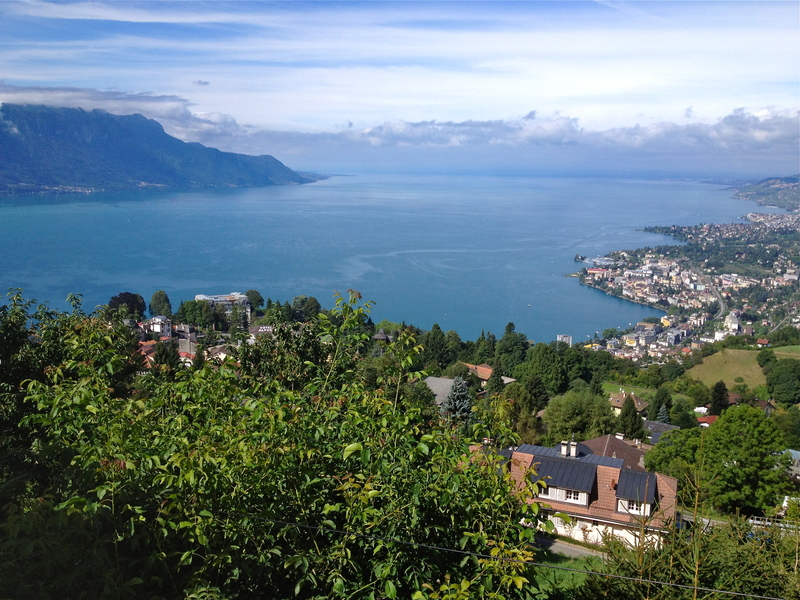 Soon after Montreux, however, the gradient kicks up as the road begins a steep 1000ft climb up to Glion. The distance to Glion is just under 4kms, but the grade becomes so steep – roughly 20% in places – that it was impossible for me to keep my heartrate down and I was soon standing on the pedals and creeping into Zone 4 just to keep forward momentum going. Just before entering Glion, I glanced at my HR monitor and it read 181 bpm! (my max HR is 186). I knew I couldn’t sustain that kind of effort for the remaining 45 minutes to an hour that it would take to reach the col, so I stopped to ponder my options and bring my HR down. There is no terrain in southern Ontario that can match the combined length and grade of this climb and I felt completely unprepared. After briefly contemplating turning around, I decided to continue and at least try for Caux, which was about another 5 kms up the road. I had no idea what to expect from the road or my body, but figured I should at least give it a shot. 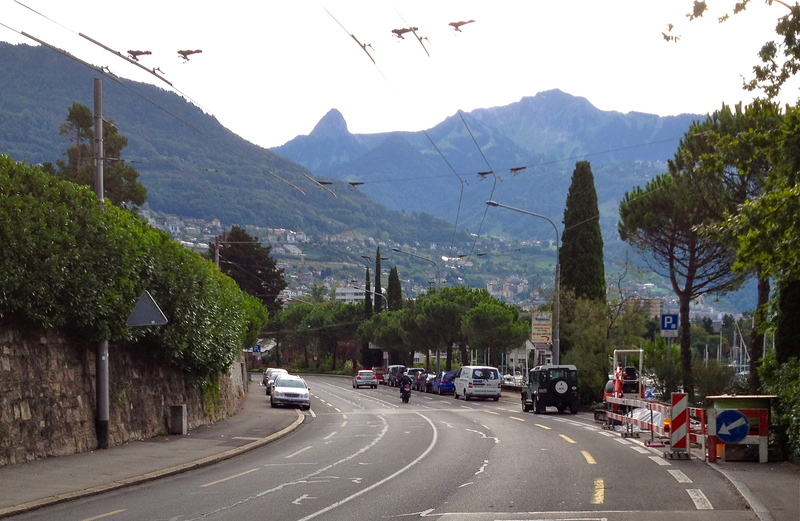 As I passed through Glion I was greeted with a “Bravo!” from a pedestrian on the sidewalk. That little bit of encouragement was all I needed to continue! I made the right decision as, soon after passing through Glion, the grade eased off just enough that I could pedal in a seated position while keeping my HR out of the red zone. Thank god for that compact front ring too! It made a big difference. The rest of the ride up to Caux was steady but manageable work up a half dozen long switchbacks and I soon found myself passing the cog rail station there. A quick time check had me in Caux at about the 45 minute mark. Judging from the looks of the GPS map on my phone, I guessed that much of the remainder of the ride would be easier, as there were no more switchbacks until just beneath the col and the road appeared to contour the side of a spur coming down off the Dent de Jaman. 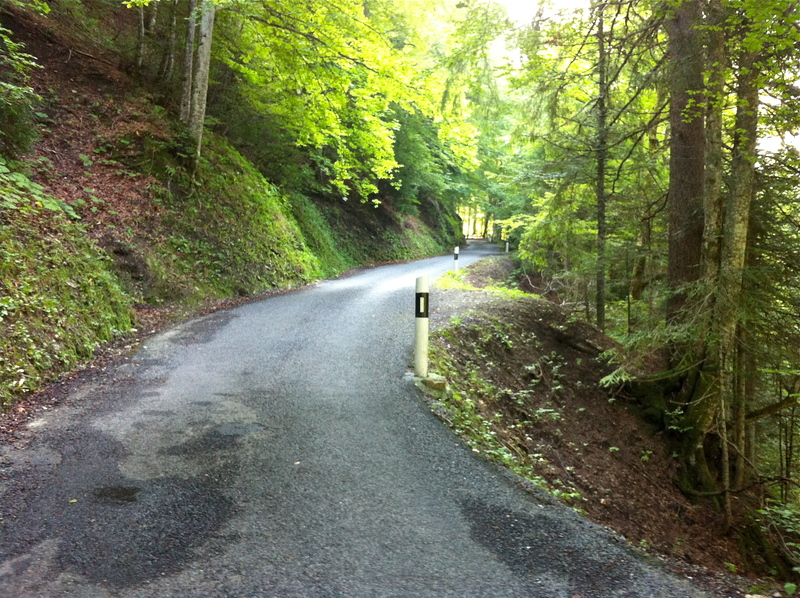 After leaving Caux the road narrowed to almost a single lane and the asphalt become somewhat rougher. Just as anticipated, the grade became much gentler and I was able to pick up the pace considerably. The narrow road proceeded to wind gradually along the side of the mountain, with the forest canopy closing in too, affording some nice cool shade. Fairly typical road conditions on the Route de Jaman. I covered the next few kilometers quite quickly and, after passing through a meadow while being serenaded by the bells dangling from the necks of the cattle grazing nearby, I soon came to the turnoff for the final steep switchbacks leading to the col. The grade once again became very steep and there were a couple of tricky moments as a van and a couple of cars passed by, forcing me close to the right shoulder and the steep drop-off down the side. The road finally brought me out into a clearing just below the col and I was at the top with a few more pedal strokes. I had just climbed 1150m (close to 4000ft) over 14.4kms in about an hour and 15 mins! I was happy to have topped out at the col, but I wasn’t feeling especially tired or sore. I guess logging all those kilometers in the hills of Oro-Medonte township was pretty decent training for the Alps after all! I took a couple of quick photos and then started back down immediately, as I was on a deadline and I was already running late. Now, one might expect the journey back down to be much faster and easier, but it was almost as epic as the ascent, although in a different way. With the road back down being both unfamiliar and incredibly steep, I rode very cautiously back down all the switchbacks, death-gripping my brake levers for fear of descending too quickly and losing control. Descending into the hairpin turns without guardrails felt like riding down a ski jump – lose control of the speed and miss the corner and you will launch into space! I was gripping the levers so hard as I descended through Glion (20%) that I thought I was going to snap a cable! In the end all was well, but I did have some pretty good hand-cramps by the time I returned to Montreux. The “typical road conditions on Route de Jaman” looks more like a bike path than a road. May you have very few “tricky moments”. Way to go Graham!! !